When you sit down for a horse movie, one thing is certain: You better have tissues. Andrew Haigh’s heart-wrenching Lean On Pete is no exception, but it’s also much more than your average boy-and-his-horse drama. The latest from the Weekend filmmaker is a quiet, melancholic tale about poverty, loneliness, and an outsider’s search for comfort. Charley, played by Charlie Plummer, is a 15-year-old who’s recently moved from Spokane, Washington to Portland, Oregon with his distant father Ray (Travis Fimmel). The two live in a shabby home with nothing but an empty cereal box in the fridge – to keep out the roaches, Charley explains to Ray’s new girlfriend (Amy Seimetz, in a too-brief cameo). The kid’s an introvert who takes care of himself while his dad spends his night drinking and carousing. But Ray’s not the worst dad imaginable; instead of the abusive father stereotype, the two actually share a sweet, playful relationship. While out jogging one morning, Charley gets a job working for a racehorse trainer (a perfectly surly Steve Buscemi). “That one’s a p—y,” Buscemi’s Del Montgomery grumbles as he hands Charley a horse’s lead. That horse is Lean On Pete, an aging Quarter Horse who’s got some speed, but is still destined for slaughter if he doesn’t win the next few races. It makes sense why Charley connects with this horse; they’re both unappreciated softies in a world of aggressive masculine types, and they’re both struggling to survive. Unlike the adults who meet Charley’s reticence with pressing questions about his life, Pete just listens. He’s maybe the only one who’s ever really listened. 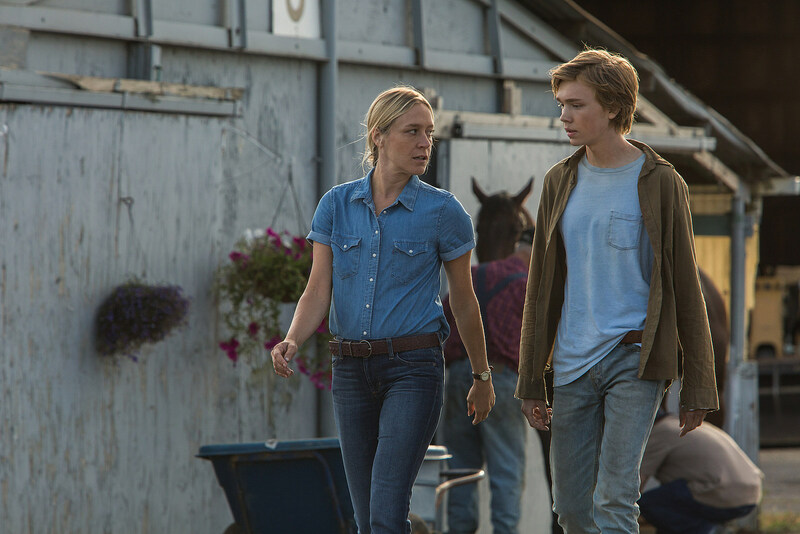 Lean On Pete, which Haigh directed and adapted for the screen from a novel by Willy Vlautin, is a patient film; perhaps too patient for some. Before Pete can get sold off, Charley decides to rescue him, sending the two runaways on a languid journey across the Pacific Northwest. We don’t learn much about Charley until he opens up to his horse as they trek along dusty landscapes. While Charley rescued Pete, the horse is really the one who helps save Charley, giving him a sense of purpose to keep going. That may sound saccharine, but Lean On Pete is told with a gentleness and a deep compassion for people living on the fringes of society. It might also be one of the most emotionally devastating films in recent memory; an understated portrait of those trapped by hardship and bad luck they can’t seem to escape. When Charley asks a young girl why she lets her drunk grandfather treat her like a servant she says, “When you don’t have anywhere else to go, you’re kind of stuck.” Whether it’s homelessness, poverty, or people working jobs they can’t stand – “If I have to look at another horse, I might shoot myself in the face,” Del gripes – no one in Lean On Pete is really living, but merely coping. As tragic as Lean On Pete is though, it’s also full of exceptionally beautiful moments of connection and sweetness, one of Haigh’s specialties. Much of that is thanks to Plummer’s performance, and his scenes opposite the horse and the stragglers who float in and out of his life. Plummer was mostly forgettable as the kidnapped teenager in Ridley Scott’s All the Money in the World, but here he’s nothing short of remarkable. He’s got an expressive face that radiates joy – his smile is so infectious I found myself beaming back at the screen – and his silent, forlorn moments will crush you. In one early scene, Charley quietly looks at Pete with such fondness I started to cry, and that’s before things became truly upsetting. And despite the supporting cast’s minimal screen time, Buscemi, Chloe Sevigny, and Steve Zahn as an erratic hobo all make strong impressions as characters who feel fully real. When I think about Haigh’s work, the word tenderness comes to mind. Both Weekend and 45 Years examined the rise and fall of relationships with profound sensitivity. While Lean On Pete isn’t quite as indelible as those two films, it’s another impressive piece of understated storytelling. By the end you may feel scooped out and heartbroken, but it will also leave you just enough hope that not everyone remains stuck forever.